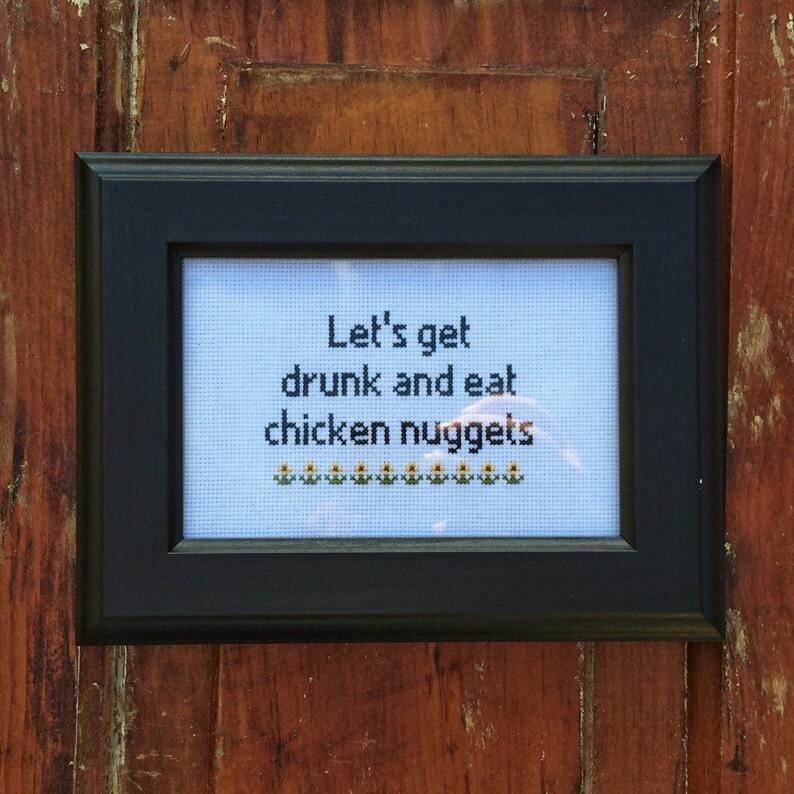 This cross stitch features the phrase "let's get drunk and eat chicken nuggets" done in black thread with a row of flowers underneath. You have your choice of any petal colour you like. You will receive this item unframed on a piece a fabric cut a little larger than 4" x 6". We cut our fabric a little larger than necessary so you can trim it down to fit your frame of choice perfectly. If you would like a custom variation of this design either leave what you would like in the "Notes" section at checkout, or request a custom order using the button on the left side of our page or the link above this. A custom variation/design may cost extra depending on what you want. Item was perfectly done! Tossed it in a frame and good to go! We offer four different payment options: direct payment via a credit card, debit card, or Etsy gift card, or you can pay us via our Paypal account. We do not offer refunds unless there has been a mistake or error on our part. We package our orders as safely as possible. We are not responsible for anything that happens to your package once we drop it off to be shipped as it is out of our control. If you'd like to do something about that, contact me and you can pay to have your item tracked. We ship worldwide and our shipping costs are listed with every item. Items are sent from Canada. Our shipping is NOT tracked, but if you wish to have your order tracked, let us know in the "Notes" section when checking out. Tracked shipping WILL cost extra. We offer proof of shipping in the form of a photo of your packaged item right before it is about to be shipped out with a date stamp so you know when we sent it.